Just 20 years ago, many archaeologists believed there was a "human revolution" 40,000-50,000 years ago during which modern behaviours such as symbolism, innovation and art suddenly arose. This was thought to have enabled a major shift in cognitive organisation and probably the advent of complex language. At the time, the earliest modern human fossils had been found in Africa and dated to some 100,000 years ago, leaving a gap between the emergence of anatomically modern humans and behaviourally modern humans. This gap in the development suggested that we only achieved "modernity" as our species migrated out of Africa and into the rest of the Old World. But this view is increasingly being challenged. Just weeks ago, we learned that Neanderthals could paint images. 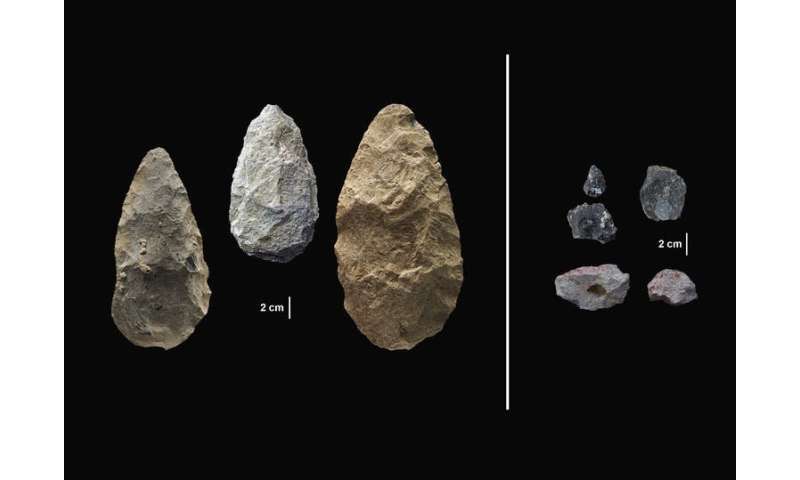 Now, three new papers, published in Science, show that technologically advanced behaviours occurred much earlier than we thought in the African stone age. Not all researchers supported the view that modernity arose outside of Africa. Writing at the turn of the millennium, archaeologists Sally McBrearty and Allison Brooks complained that this view was Eurocentric and brought about by a profound under-appreciation of the depth and complexity of the African archaeological record. They argued that components of the "human revolution" were to be found in the African Middle Stone Age some 280,000-50,000 years ago. Now, two decades later, Brooks and her colleagues have presented well-dated evidence from the Olorgesailie Basin in Kenya that places the evolution of some of these behaviours much further back in time. They highlight technological change at around 300,000 years ago that likely occurred in response to the effects of long-term, global environmental and climatic change. Around 800,000 years ago, the Olorgesailie Basin comprised a series of floodplains. Over the course of the next several hundred thousand years, the climate changed and the area developed into a vast arid grassland with massive turnover of prey mammal species as a consequence. This would have made life difficult for early humans in the region by making food sources unpredictable. Human populations needed to adapt or go extinct. The crux of these papers is that hominin populations did not disappear – so at least some of them must have adapted technologically and culturally, with the environment driving greater mobility, information gathering and sharing, and innovation. 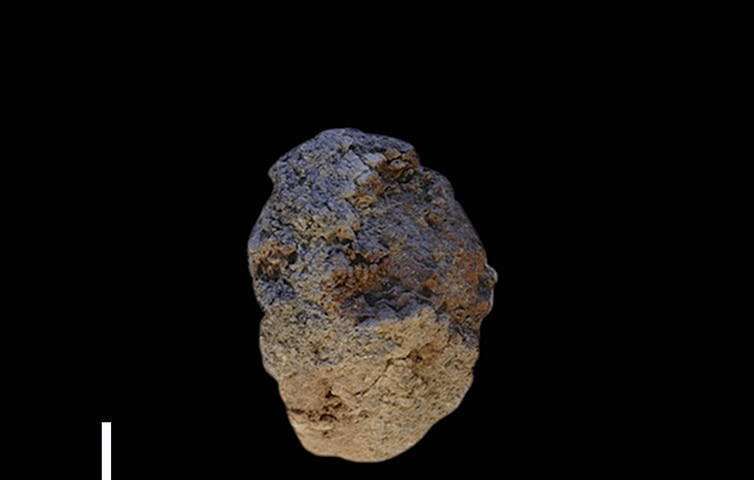 Based on excavations at five sites dating from 320,000 years ago, the team found distinct differences in the forms of stone tools compared to older deposits in the area – suggesting technological innovation had taken place. Older sites yielded large, bulky stone tools such as hand axes and cleavers. This technology is generally referred to as Acheulean (Early Stone Age). In contrast, these sites at Olorgesailie contained much smaller, standardised pieces such as points and blades, some modified in a manner that made hafting possible. The team therefore classified them as Middle Stone Age industries. Many of the tools were made on obsidian (a volcanic glass) rather than rock. What's more, chemical testing indictated that these raw materials came from 25-50 km away, and some from further afield. Some of these tools were made at the site and not brought in as finished items. Older handaxes versus newer technology at the site. Obsidian wasn't the only exotic material – they also discovered bright red ochre pigment displaying evidence of grinding and cut marks, which makes this among the oldest known pigments used to colour rocks in the archaeological record. 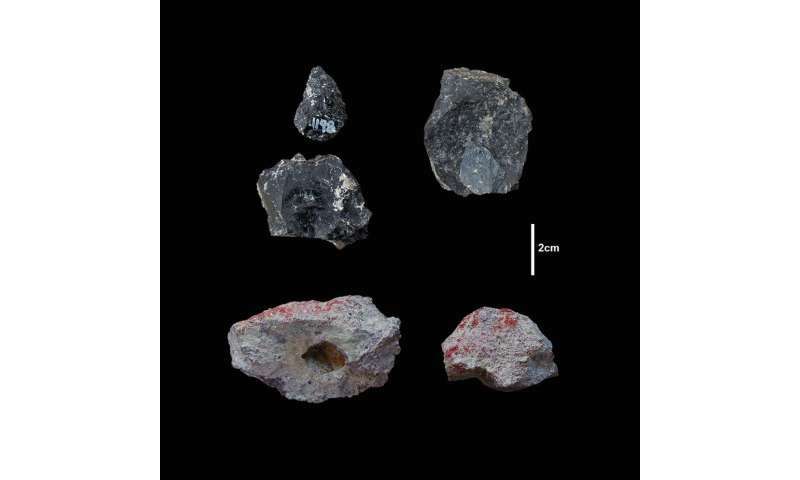 Together, the glass and ochre mark the earliest evidence for long-distance transport of raw materials in the East African record. Across Africa, the Middle Stone Age is characterised by the absence or rarity of large cutting tools and the presence of prepared core technologies for making sophisticated points and blades. Crucially, the transition between the African Early and Middle Stone Age occurred around the time that our own species, Homo sapiens, was evolving across the continent. It might therefore be tempting to treat the appearance of the earliest Middle Stone Age technology as a cultural marker linked to the evolution and appearance of our own species – a smoking gun for evidence of the modern human mind. But it is probably too soon to jump to that conclusion. 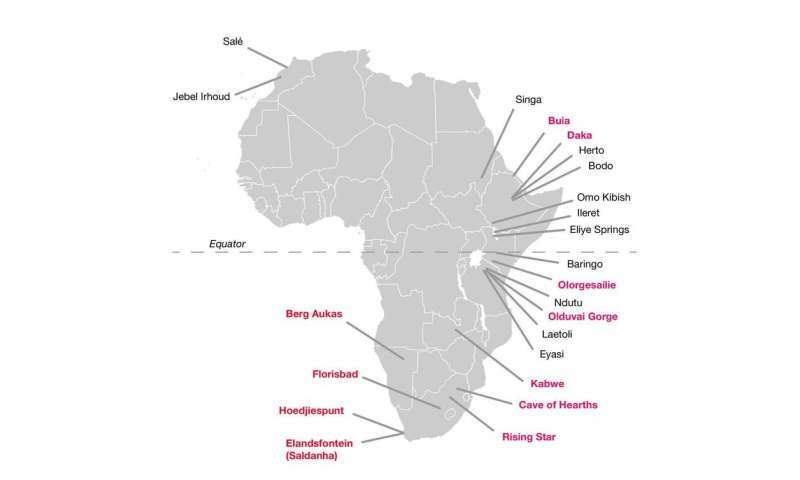 Elsewhere across Africa, the association between Early and Middle Stone Age and pre- and fully-modern human fossils remains complex and confusing. Before 400,000 years ago, there are Early Stone Age sites which contain components such as blades and prepared cores. These are associated with archaic rather than modern human fossils such as at the Cave of Hearths. Conversely, we know that the production of Acheuelean large cutting tools by modern humans continued well into the period of the Middle Stone Age – such as at the 160,000-year-old site of Herto. What is genuinely exciting about the discoveries in the Olorgesailie Basin is that we now know that one or more hominin groups were doing seemingly "modern" things at this critical time period. New tool forms and exotic materials require an understanding of space and time – bringing materials over great distances and passing on technological skills through successive generations. This suggests expanded social networks, transmission of information and technological innovation. It does seem that the "human revolution" that made us modern never was – archaeological evidence for modern behaviours arose much earlier, starting in groups that predated our own species. Every criterion that has historically been used to differentiate modern humans from archaic humans – culture, art, treatment of the dead, ornamentation and abstract symbolism – has much older examples. 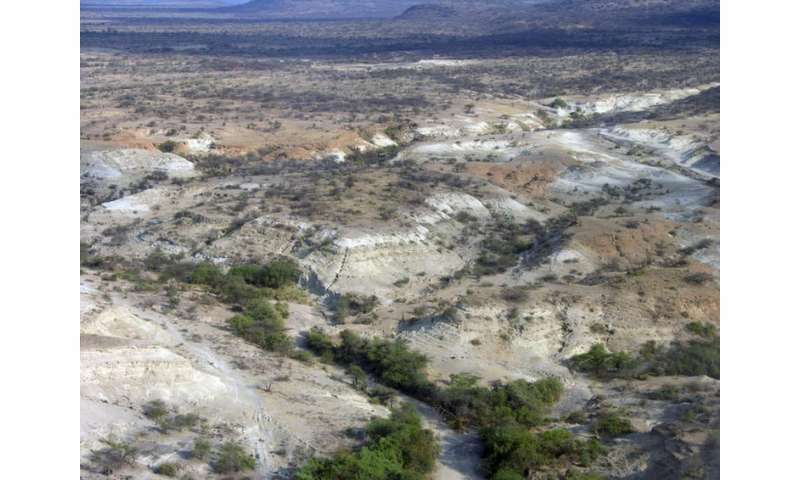 What remains to be understood, however, is the relationship between complex behaviours and hominin species from 500,000 years to 160,000 years ago when many species of hominins (not just modern humans) inhabited the African landscape. Gradual complex change is more difficult to interpret than revolution.